Home Eye CandyOh the horror…. I’m always on the hunt for a good horror movie. In my opinion they are few and far between, with most of them in the last 6 years since Saw hit the scene being total absolute crapola. Sure the slasher genre existed before Saw but Saw gave birth to the straight out torture people for the whole length of a film genre that frankly I get nothing from. There was maybe a glimmer of something in the first Saw…I think…perhaps…but it’s been mostly downhill from there. Now to be clear I do not object to blood, gore, or violence in a horror film. After all I shouldn’t be watching horror if I did. Horror is about the dark side of our nature. It’s about exploring the ugly underbelly of what it means to be human but in a safe setting. It is looking for the line between madness and lucidity. That has GOT to include some blood, gore and violence. But I want atmosphere, suspense, a building of the horror. I want to be horrified as much by the unseen and unanswered as I am by the gross gore. I don’t want to move from one seemingly-endless cruel torture to another in a slobbering maniacal show of trying to top the last torture with the next. If you want that why not just seek out some snuff stuff…shudder…. I’m always afraid to make “Best Of” or even “My Favorites” type lists because I have a memory like Swiss cheese and I inevitably forget important items for the list. But I thought I’d give a “Worth Mentioning Horror Films Cause I Like Them And Can Remember them Right Now” list. Then maybe you can help me out by listing your favorites..or ones I should have mentioned in the comments? This is not particularly in any order although the my life would have been different had I not seen them ones may kinda be towards the top. 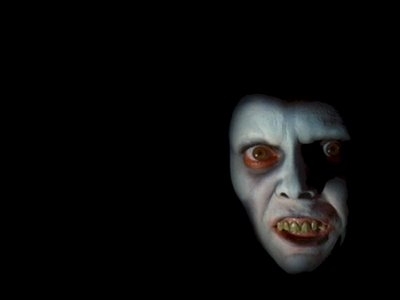 (1) The Exorcist – To this day…having seen it dozens of times..it still gives me chills. The scariest horror film of all times (IMO). (2) The Shining – Never gets old for me. This is one of the films that I have a rule about. If I am surfing looking for something to watch and happen to spot this playing I MUST stop and watch it. Doesn’t even matter at what point it is in the film. The best horror Stephen King adaptation ever (Stand By Me is the best non-horror IMO). (3) American Werewolf In London – So very clever and still the best werewolf transformation I have ever seen on celluloid. I think it holds up to this day and the fact that it is shot it full light…no hiding anything adds to it’s perfection. I got excited all over again watching this clip. Good stuff. (4) Nightmare On Elm Street (the original) – I know some may disagree with me on this one. But I honestly feel the first one…before all the silly Freddy one-liners…was a great horror film. Perhaps not perfect. But then again what is? And this one really got under my skin at the time. Now the quick succession of II and III and IV (etc…?) and the trying-so-very-hard-to-be-camp-and-clever silliness kind of ruined the love I had for the original. But, if I transport myself back to seeing the first, and erase the mess that followed from my mind, I can still see just how creepy and great the first one was. (5) Angel Heart – Ah Mickey Rourke….brilliant. Wish I could drop a decent scene into this post but the only one I can embed is the sucky trailer. (6) Jacob’s Ladder – Very influential film. Tim Robbins at his best. I see little bits and pieces of this film over and over again in other films. This is the first time I remember seeing the head moving so fast you can’t see it thing that I have seen what feels like hundreds of times since then. That “gimmick”, for lack of a better word, is seared into my brain forever. There’s something about it that’s just so plainly and simply wrong that my brain screams “No!” at me every time I see it. (7) The Serpent and the Rainbow – Good stuff. Left a big impression on me. (8) Let the Right One In – One of the few recent horror films that I love. I wrote a bit about it and the American remake here. The atmosphere in this film is just perfect. You are kept right on the edge of something the entire time. So very good. If you haven’t seen it you should. And although I was boycotting the “We are Americans so We Can’t Read Subtitles” recent remake of it I have it from a very trustworthy source that the remake is actually good as well. (9) Hour of the Wolf – I mentioned atmosphere in #8 above. Well no one…and I mean NO ONE…has ever done atmosphere quite like Bergman. This film makes you feel like somehow maybe it is YOU who is going mad. Brilliant.